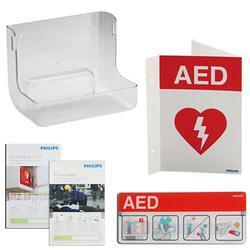 Philips Healthcare Defibrillator Wall Mount and Sign Awareness Bundle- Sign, Placard, Posters, and Clear Wall Bracket. An excellent way to display your Philips HeartStart AED and create AED awareness at every AED location. This bundle contains items with easy-to-understand graphics which raise awareness of passers-by about how to use an AED in an emergency. Please note: AED Wall Mount Bracket requires the use of the Standard Carry Case.